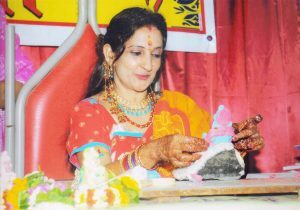 Rama Shah, 39, a staunch devotee of Lord Ganesha, made 9999 idols in 99 days during August 2000. She has designed Ganeshas in a pista shell, to Ganeshas on swings, from Ganeshas on marble to Ganeshas on envelopes. She has skillfully created Ganeshas in different colors Green, blue, yellow and orange.